Liczba stron: 452 Jest to ujednolicona liczba stron, która ułatwi Ci porównanie długości książek. Każda strona Legimi to 200 słów. 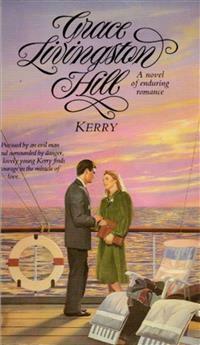 Pursued by an evil man and surrounded by danger, lovely young Kerry finds courage in the miracle of love. Copyright 1931 Grace Livingston Hill. Kerry Kavanaugh thought when her beloved father died that the worst that could had come upon her. The day her mother told her, six months after her father’s funeral, that she was going to marry again, and that she was going to marry Sam Morgan, the multimillionaire, Kerry knew that there were worse things than death. Sam Morgan had been a youthful acquaintance of Mrs. Kavanaugh’s—a sort of skeleton in the closet ever since Kerry could remember. Then Kerry’s father would look at her mother with something steely in his blue eyes, his thin sensitive lips pressed firmly together, and would seem about to say something strong and decided, something in the nature of an ultimatum. But after a moment of looking with that piercing glance which made his wife shrink and shiver, a softer look would melt into his eyes, and a stony sadness settle about his lips. He would get up, draw his shabby dressing gown about him, and go out into the draughty hotel hall where he would walk up and down for awhile, with his hands clasped behind his back, and his gaze bent unseeing on the old ingrain carpet that stretched away in dim hotel vistas. On one such occasion when Kerry was about ten, she had left her weeping mother huddled in a blanket in a big chair, magnifying her chilliness and her misery, and had crept out to the hall and slipped her cold unhappy little hand into her father’s; and so for a full length and back they had paced the hall. Then Father had noticed that Kerry was shivering in her thin little frock that was too short for her and too narrow for her, and he opened wide his shabby dressing gown, and gathered her in close to him where it was warm, and so walked her briskly back another length of the hall. Then a stricken look came into Father’s eyes and he looked down at Kerry solicitously. “Oh yes!” assented Kerry eagerly, for she could see that a happier light was coming into her father’s eyes, and she really admired her frail little mother’s looks very much indeed. “Oh yes!” said Kerry again quite eagerly. “Yes?” said Kerry with a question in her voice. “And she loved me. She wanted to come!” It was as if he were arguing over and over with himself a long debated question. Then Kerry’s father stopped her words with a kiss, and suddenly hastened his steps. “You mean that ugly fat Sam Morgan, Father?” Kerry had asked innocently with a frown. “Oh, not that man!” said her father sharply. “He is a—a—louse!” Kerry remembered how her father had spoken the word, and then seemed to try to wipe it out with his voice. “Oh yes,” caroled Kerry for she could feel that a different tone was coming into her father’s voice, the tone he wore when he went out and bought Mother a rose, and made jokes and laughed and cheered Mother so that she smiled. Kerry was glad the cloud was passing, so she promised. But she always remembered that promise. And she never forgot the tone her father used, nor the look of his face, when he called Sam Morgan a louse! That was a word nice people didn’t say. It was a word that she had been taught not to use, except when it applied to rose insects. It showed that Father felt very deeply about it that he would use the word, and she could sense that there had been apology to her in his eyes when he used it. She would never forget the thought of that great big thick-lipped Sam Morgan as a louse crawling around. Even as a rose louse he acquired the sense of destructiveness. Rose lice spoiled roses, and her beautiful little mother was like a rose. After that Kerry’s father worked harder than ever on his book. He used Kerry’s little bedroom for a study, and his papers would be littered over her bed and small bureau, and Kerry never went in there except when she had to, to get something, while Father was working; and then she went on tiptoe. He was always deep into one of the great musty books he brought from the library, and he must not be disturbed. He told her one day that he was going to make Mother rich when his book was done, but there was still much work to be done on it, much much work, for it was to be the very greatest book of its kind that had ever been written, and it would not do to hurry, because there must be no mistakes in the book. Kerry’s mother read a great many story books, and ate a great deal of chocolate candy. Sometimes she gave some to Kerry, but most of the time she said it wasn’t good for little girls. Kerry went to school whenever they stayed long enough in a place to make it worth while, for Father had to go to a great many different places to be near some of the big libraries so that he might finish his book sooner. And then when they would think he was almost done with the book, he would find out there was some other book or books he must consult before he would be sure that his own was complete, and so they would journey on again to other cheap hotels. In this way they spent some years in Europe, and Kerry had wide opportunities of seeing foreign lands, of visiting great picture galleries, and wonderful cathedrals, and studying history right in the historic places. For often Kerry’s father would stop his work in the middle of a morning, or an afternoon, and take her out for a walk, and then he would tell her about the different places they were passing, and give her books out of the library to read about them. He taught her Latin also, and to speak French and German and Italian. As she grew older, she would go by herself to visit the galleries and great buildings, and would study them and delight in them, and read about the pictures, and so she grew in her own soul. Sometimes, on rare occasions, her beautiful mother would go with her to a gallery, dressed in a new coat, or a pretty hat that her father had bought for her, and people would always turn to look at the beautiful mother. Once Mother told her that she had been called the most beautiful girl in her home town when she married Father. And once, when Mother and she had gone to the Louvre together, Sam Morgan had suddenly turned up. Kerry had not seen him for several years, and he had grown puffier and redder than before. There were bags under his eyes, and he wore loud sporty clothes. Kerry’s mother was rapturously glad to see him, but Kerry hated his being there. He tried to kiss her, though she was now sixteen, just back from school in Germany. Kerry shied away, but he did kiss her full on her shrinking mouth with his big wet lips, and she hated it. She looked at him and remembered that her father had called him a louse! She took her handkerchief out and opening it wiped her lips, hard, and then she walked away and studied the pictures until her mother called her and said they must go home. Even then Sam Morgan had walked with her mother down the street till they reached their own hotel, but Kerry had walked far behind! Kerry had never mentioned this to her father, but somehow he always seemed to know when Sam Morgan had been around and Mother had seen him. For two long years Kerry had been put in a school in Germany, while her father and mother went to Russia and China and some other strange countries because it had been found necessary for the sake of the book. They had been long years to Kerry, and she had worked hard to make the time pass. Her only joy during those two years was her father’s letters. Her mother seldom wrote anything except a little chippering postscript or a picture postcard. Kerry sensed that her father had promoted even those. Yet Kerry loved her mother. She was so very beautiful. Sometimes Kerry took delight in just thinking how beautiful and fragile her mother was. It seemed somehow to make up for all the things she lacked, like not being well enough to keep house and make a home for them, and not being able to eat anything but the dainties, never any crusts. Kerry had been brought up to really like crusts. The money to pay for Kerry’s tuition ran out before the two years were over, but Kerry won a scholarship which carried her through to the finish of her course; and she stuck to her study in spite of her loneliness and longing to be with her father—and her beautiful mother. When she joined them again it was in London, and she was startled to find that her father had been growing old. There were silver edges to his hair, and lines in his face that had been there only occasionally before she went away. Now they were graven deep. The book, he told her, was almost done. It needed only copying. He must look up a typist. But first he must try to write something for the papers that would bring in a little extra money to pay the typist. They really had spent a great deal that season because the mother had not been feeling well, and had to have a better hotel, and luxuries now and then. Then Kerry surprised her father by telling him that she had learned typing at the school so that she might help him, and they only needed to look out a cheap second-hand machine to rent and she would begin the work at once. It was a great joy, those days she spent working with her father. Neatly the pages mounted up, page after page, with all the little notes put in so carefully, just where her father had marked them on his diagram. She even managed to sketch a couple of diagrams for him and her cheeks glowed at his praise. All the little scraps of paper on which he had written his notes, all the bits of yellow paper, white paper, blue paper, backs of business letters, even brown wrapping paper that had been scrupulously saved and used in the precious manuscript were marshaled, number by number, scrap by scrap, until they were all there in orderly array, the fruit of his labor and scholarship. Her father! How proud she was of him. She was almost seventeen when she began to help her father in the final stage of his book. It was about that time that Sam Morgan had appeared on the scene. But nothing could take away her joy in the life she was living with her father. Not even a louse! She brushed him off from her thoughts as she might have whisked away an insect. Her mind was opening up now. She saw, as she copied, day after day her father’s great thoughts, how really wonderful he was. She began to comprehend what a stupendous work he had undertaken. She began to take a deep personal interest in it, and its success. She even ventured a suggestion one day about the arrangement of certain chapters, and her father gave her a quick proud look of admiration. Kerry had a mind. Kerry had judgment. He drew a sigh of quivering delight over the discovery. “Oh Father!” Kerry’s eyes filled with tears of terror at the thought. Then Kerry put down her work and came over to her father’s side. She was only half reassured, and went back to her work with a cloud of anxiety in her heart. Six months later her father lay dead after a sharp brief heart attack, and the world went black about her. The world went black for Kerry’s mother too, in a material sense. She insisted on swathing herself in it in spite of Kerry’s strongest protests. “Oh, but your father didn’t realize what it would be to us, Kerry, to be left alone in a world that was going gayly on, and not show by some outward sign how bereaved we were! Kerry, how can you begrudge me the proper clothes in which to mourn your father. That was one thing about him, he never begrudged me anything he had. He always spent his last cent on me! You must own that!” And the widow sobbed into a wide black bordered handkerchief for which she had that morning paid two dollars in an expensive mourning shop in London, while Kerry sat in the dreary hotel apartment mending her old glove to save a dollar. Well, she might have done it once. Kerry almost had her doubts. But she certainly had lived the rest of her life on the strength of that one sacrifice! But the indignation passed away as her mother lifted her pitiful pretty face helplessly. Kerry turned away in silence, and the mother went on ordering her black. Satins, crepes, a rich black coat, a hat whose price would have kept them comfortably for a month, expensive gloves, more flowers, even mourning jewelry and lingerie. Now that she was started there seemed no limitation to her desires. As the packages came in Kerry grew more and more appalled. When would they ever pay for them? But over one matter Kerry was firm. There was a battle of course, but Kerry could not be moved, though later she compromised on a cheap black dress of her own selection for the funeral. But the mother battled on every day. “Mother!” Kerry’s indignation burst forth in a word that was at once horrified and threatening. It was of no use to argue, and Kerry, sick at heart, finally compromised on the one cheap dress for herself. In truth she really needed the dress, for her wardrobe was down to the very lowest terms. Sam Morgan did not come to the funeral. Kerry was always glad afterwards to remember that! She could not have stood his presence there. It would have been like having vermin in the room, a desecration. But other men came, noble men, some of them from long distances. Professors from the nearby universities. Telegrams poured in from practically all over the world, noted names signed to them, scientists, literary men, statesmen, great thinkers, even kings and presidents. The noble of the earth united to do him honor, and his widow sat and preened herself in her new black, and ordered more violets, wondering that her simple-hearted husband should have called forth so much admiration. Why hadn’t she known in time that he was such an asset, and managed somehow to turn his prestige to better account financially? Sam Morgan did not turn up for three whole weeks after the funeral, and it was even some days after that that Kerry discovered he was in Europe. Kerry was hard at work on the book. Carefully, conscientiously, she had gathered every scrap of paper on which the wise man had jotted down the least thing, and they were under lock and key except when she was working on them. She did not trust her mother’s judgment. In a fit of iconoclasm she might sweep the whole thing into the fire. Kerry foresaw the day when creditors would come down upon them for georgette and crêpe and gloves and hats and furs and jewelry, for now a fur coat had been added to the extravagances. Her mother was spending money like water and would not realize until it was all gone. Kerry’s father had laid her beautiful little mother upon her as a care, and when the income was gone, then Kerry must be ready to pay the bills. So she worked night and day, and shut in her room did not notice how often her mother was out for the whole morning or afternoon. The book was almost done. When it was finished, Kerry meant to take it to America to the publishers with whom her father had been corresponding. She knew there would be a battle with her mother, for Mrs. Kavanaugh hated America. She had grown used to living abroad and intended to stay there. She had even talked about the South of France for another winter, or Italy. Kerry let her talk, for she knew there would be no money for either going or staying. She was much troubled in mind where the money for their passage was to come from, for she doubted being able to restrain her mother’s purchases, and it was still several weeks till another pittance of their small annuity would arrive. Yet she determined that nothing should delay her trip to America as soon as her work of copying was completed, even if she had to get a job for a few weeks in order to get the price of passage. Then suddenly Kerry became aware of her mother’s renewed friendship with Sam Morgan. Kerry had retired to her little room and her typewriter as usual after breakfast, but found after copying a few pages that she had left a newly purchased package of paper out in the sitting room, and came out to get it. Her mother stood before the small mirror that hung between the two front windows, preening herself, patting her hair into shape, tilting her expensive new hat at a becoming angle, and something glittered on her white hand as she moved it up to arrange her hair. Kerry stopped where she stood and an exclamation broke from her. Mrs. Kavanaugh whirled about on her daughter, and smiled. A little bit confused she was perhaps at being discovered prinking yet quite confident and self-contained. “It certainly is becoming, isn’t it?” she said and turned back again to the glass. A premonition seized upon Kerry. Something—something—! What was her mother going to do? And then she caught a glimpse of the flashing stone on her hand again. “Mother!” she said helplessly, and for a second felt a dizziness sweep over her. “Why, where are you going?” she managed to ask, trying to make her voice seem natural. “Why, I’m going out to lunch, dear,” she said sweetly. “You won’t mind, will you?” as if that were an almost daily occurrence. “Out to lunch?” Kerry could not quite tell why she felt such an inward sinking of heart, such menace in the moment. “Mr. Morgan!” repeated Kerry in a shocked voice. “You don’t mean you would go out to lunch with that—that—” she wanted to use the word her father had used about Sam Morgan but somehow she could not bring herself to speak it—“with that man my father so despised!” she finished bitterly. Kerry put out her hand almost blindly and wafted away her mother’s words; impatiently, as one will clear a cobweb from one’s path. “Oh, Mother!” cried out Kerry helplessly, “don’t talk that way. I am eighteen. I am not a child any more. You know that man is not fit—” And then suddenly she noticed the diamond again and her eyes were riveted to it in a new fear. The mother glanced down with a sudden flush, and laughed a sweet childlike trill. “Stop!” cried Kerry flashing her eyes like blue lightning, her face a deathly white. “Stop!” and then with a great cry she burst away from her mother, shut herself into her own room and locked the door. Kerry stood behind that locked door, a flaming, furious, frantic young soul, desperate, helpless, bound by the submission of years. Her mother! Her beautiful mother! Going to marry that awful man! It could not be true. It must be some awful dream! It must be a nightmare that would pass! She put her cold trembling hands over her eyes, and brushing away the vision of the present, tried to conjure up the dear dead past. She heard her mother moving about the other room, little familiar movements, in her gentle, deliberate way. Mother was a perfect lady always, nothing impulsive or unconsidered about her habits. The shoving of a chair, the clink of the handglass as she laid it down on the old-fashioned marble shelf under the mirror. Kerry could almost vision her turning her head critically before the mirror to get one more glimpse of herself in her new hat before she went out. And she could do that, when her child was suffering so on this side the closed door! But that was an old hurt, almost callous now. Now—! She was stepping across the floor. That was the board in the middle of the room that creaked! She had picked up her bag and gloves from the table, and now she stood a moment to put on her gloves, turning again to get another glimpse of the new hat. Kerry’s eyes were closed, and the door against which she leaned was locked, but she could see it all, every motion. Now, she had turned and was walking toward the hall door. She was going! In another instant she would be gone! Gone with that awful—! Kerry fumbled with the key frantically. It came out in her hand and had to be fitted in again! Oh, why had she locked her door! She would be gone—hopelessly—forever—perhaps!—It must not be! She must stop it! She must! Father would expect her to do something—! The key slid into its hole again and she broke out into the sitting room wildly, the tears splashing unheeded down her white cheeks. The hall door was just closing, but it halted on the crack, and slowly swung open a couple of inches. “Well?” said a cold voice, cold like icicles. The door opened a trifle wider and Isobel Kavanaugh’s delicately pretty face appeared. “What is it you want, Kerry? I’m late now, I cannot come back!” Her voice was haughty and unsympathetic. Mrs. Kavanaugh stepped inside and drew the door to. “You’ll have to hurry!” she said coldly. Kerry was like a bright flame as she went rushing toward her mother. Her hair was red gold and as she crossed the room a ray of sunlight, the only ray that could get inside that dark hotel room, caught and tangled in its wavy meshes. It set a halo about the white face, with the great purply-blue eyes set like stars, wide apart. In her earnestness, her awful need, her face shone with hurt love and tenderness. Unconsciously Kerry had chosen the only mode of approach that could possibly have halted this vain woman a moment longer. For an instant she was almost mollified. Then she looked startled into the lovely illumined face of her daughter and saw her beauty as she had never seen it before. Saw that it was beauty even deeper, and more wonderful than her own, for with its delicacy was mingled a something of the intellect—or was it spirit?—they were all one to Mrs. Kavanaugh—that made it most unusual. Then too, there was that red-gold hair—or was it gold-red?—that the mother had always regretted and called plain red. She saw like a revelation that it made a startling combination. Kerry, in her trouble had suddenly grown up. Kerry was beautiful! Then with the first throb of pride that made her look again, came another thought more powerful. Kerry would be a rival! “But Mother, he was only sorry about you. He was talking of you so lovingly,” pleaded Kerry. “What did he say?” demanded the now furious woman. The fury went out of the woman’s eyes. She lifted her chin vainly with a little smile of self-consciousness. “Oh, well, he would,” she answered half sneeringly. “You know my dear, your father thought no one was worthy of me, not even himself, I’ll say that for him. Not even himself. He was always humble enough. He knew his limitations, your poor dear father did!” Her tone was amused, reminiscent of a past which she scarcely seemed to regret. A great anger surged over the girl, her vivid face flamed, and her dark eyes burned with unspeakable emotions. “A word! What word? What do you mean? I insist on knowing!” The cold voice beat on the girl’s consciousness like shot. Kerry brought it out reluctantly, and in the great silence that followed for an instant she could hear her own heart beating. But the echoes of the room were broken by a harsh laugh. But Mrs. Kavanaugh, deeply stirred for the instant by her daughter’s pleading, was stung into contempt by the mention of the book. With a curl of her lip she froze into haughtiness, and swept Kerry aside almost fiercely. “Oh, that book! You and your father are crazy together!” she muttered as she stepped over the prostrate girl and hurried down the hall. The tone and the look she cast back at her child wounded Kerry as if she had struck her. Covering her face with her cold hands she crouched by the door until the sound of her mother’s little high heels had clicked away into silence, and she knew that she was actually gone. Then she gathered herself up heavily, and shut the door, dropping into a chair and sitting for a long time with her face in her hands. A long time she sat there, trying to think, trying to still the wild rebellion of her heart, trying to find a way out of the terrible maze that life had become. At last she rose and went swiftly into her own room and began to work at the book, feverishly, frantically. If she could only get it done! If she could only get it to the publisher and prove to her mother that it was going to be worth something! If she could only do this in time, perhaps, perhaps she might be able to persuade her mother not to do this dreadful thing; not to tie herself for life to that dreadful man! If Mother was sure of plenty of money to spend she would listen to reason. Mother was afraid that they both would be penniless. That was the matter. Poor little, beautiful, judgmentless Mother! Thus Kerry tried to excuse her parent, and salve the wound that last cold look of Mrs. Kavanaugh’s had inflicted. Thus she worked with bright red cheeks, and bated breath, her fingers flying over the keys of her machine as they had never flown before, trying to beat time and finish the book before her mother should wreck both their lives. But all the time as she worked with tense brain, there was that undertone of hurt, that running accompaniment of excuses for her mother—her dear beautiful mother. The only little mother she had! The mother whom her precious father had loved so deeply—so tenderly. Poor Father! Where was he now? Did he know of this awful thing that was threatening her life? What would he tell her to do? And her fingers flew on. She did not stop to eat. The thought of food was distasteful. She had but that one purpose—to get done. There came an interruption. A knock on the door! A man from the undertaker’s had come with a bill. He wanted to see her mother. He said Mrs. Kavanaugh had promised that he should have his money that afternoon, that he needed it to meet a note. He had been several times on the same errand, but she had promised to have it ready for him if he came this afternoon. Kerry stood with the bill in her hand staring at the figures, a great wave of indignation surging through her. Fifty dollars was all that had been paid on her father’s burial! And she had thought that it was all covered by the money which their lawyer had sent two days after her father had died. There had been enough, even to cover the expensive clothing that Mrs. Kavanaugh had insisted upon. What had become of the money? “Mrs. Kavanaugh is not in at present,” Kerry managed to say, out of a throat and lips that had suddenly become hot and dry. Her voice sounded hollow and unnatural to her own ears. A ray of hope sprang into her heart. “I will go and look,” said Kerry quickly. Yet with sinking heart she turned toward her mother’s bedroom door, knowing even against her anxious hope that she would find nothing. Kerry snapped the lid shut, clicked the key and closed the drawer, her face drained of every semblance of color. Somehow she managed to get back to the other room and dismiss the undertaker with a promise about to-morrow. But when he was gone she sat down and groaned. She was still sitting there in helpless sorrow when a few minutes later her mother applied her latch key and entered. The mother’s voice was amused, half contemptuous, as she breezed happily in, filling the tawdry room with the scent of violets from a great bunch pinned to her coat. Then she caught sight of the somewhat familiar bill lying on the floor where Kerry had dropped it, duplicates of which had been coming to her at brief intervals ever since her husband’s burial. “Oh, mercy!” said Mrs. Kavanaugh in a bored tone, “Has that tiresome man been dogging my steps again? I certainly would never go to him again if all my family died. Well, you needn’t be so tragic about it. I’ve got the money to pay for it now, any way, and then we’ll be done with him. Look, Kerry!” and she displayed a great roll of bills, fluttering her white fingers among them gloatingly, the diamond glistening gorgeously. But Kerry dashed the roll of bills to the floor and caught her mother’s white hands in her own frantically, gripping them so tightly that the great diamond cut into her own tender flesh like a knife. “Oh, I thought he could wait till the next annuity came in. Those undertakers are all rich!” said the woman carelessly, beginning to preen herself at the mirror again. But Kerry held her head high and looked her mother sternly in the eyes. “You will never pay for my father’s burial with money from that man!” she said in a low steady tone. Then she marched straight over those loathsome hundred-dollar bills to her bedroom door, and with her hand on the knob stood watching her mother. Mrs. Kavanaugh laughed disagreeably and gathered up her money. Then Mrs. Kavanaugh went into her bedroom and shut the door. Kerry stood in front of her own door, her face white and set, staring at the door that had shut her mother away from her. It seemed like the closing of an eternity between them. A long time she stood there trying to think. She heard her mother going about her room, putting away her things, even humming a little tune, a gay little air she must have heard out in the world where she had been that day. The girl looked bitterly toward the undertaker’s bill lying on the floor. One thought burned within her soul. Her father’s burial must not be paid for with money furnished by Sam Morgan. There might be humiliations to come, but that should never happen. She knew that he would have chosen rather to be buried in the potter’s field than to have had such a thing happen. Of course, one amount of money was the same as another equal amount, but she could not stand the thought that her mother could have done such a thing—spent the burial money on herself, and then be willing to use Sam Morgan’s money in its place. Kerry stood there staring at her mother’s door, until she heard her mother lie down for her nap. She stood there while a great purpose grew within her, and until her limbs began to tremble and her feet ached. She must do something about it. She must prevent her mother’s paying that bill with unholy money! Quietly she went into her room and got her hat and coat. Cautiously she stole back through the sitting room, picking up the bill as she passed, and opened the door of the cloak closet. Yes, the big brown box was still there on the shelf, the cord lying in a snarl on the closet floor. Mrs. Kavanaugh never was known to put anything away. Kerry lifted the lid of the box to make sure the coat was still inside. It had been too warm to wear it. Mrs. Kavanaugh had had it out only once since its arrival, and Kerry’s questions and anxiety about the price had caused her to put it out of sight again. Yes, it was there safely, lying in velvety lovely folds under the tissue paper. Kerry felt like a thief as she lifted the big box down from the shelf, tied the string firmly about it, carried it out into the hall and closed the door cautiously behind her. Yet this thing was right that she was doing. It was just. Her mother had no right to take the money that her father had left for his burial and buy luxuries for herself, and then force his enemy’s money upon her husband. She would take the coat back where it was bought and beg them to return the money. If they would not do that she would sell the coat for what she could get and pay that bill. But her mother should not be allowed to do such a monstrous thing as that to her dead husband. Even though it might be only an idea, it was an idea that the loving daughter could not endure. Kerry’s heart was beating wildly, and there was a set to her lips that reminded one of her father, as she stepped out into the street carrying the great box. She trembled as she climbed into a tram car and paid her fare. She trembled more as she got out at the corner near the fur store and started toward the door. Now that she was here it seemed a preposterous thing she was about to do. Sell her beautiful little mother’s coat! Sell it without her knowledge! The habit of the years clutched at her throat and tried to detain her, but her loyal feet carried her straight inside the door, and her brave voice, though it trembled, gathered courage to ask for the proprietor. She was told he was busy, and she was left to wait in a dark little corner of an office. That half hour seemed a century, and she went through tortures as she schooled herself to meet a scornful proprietor, and become a humble suppliant. Over and over she conned the words of a speech she had thought out, fearful lest she should forget; reminding herself constantly that she must in no wise reflect upon her mother, her beautiful little mother. Father would not like that. Father had told her to remember—! Was it the thousandth time she had said that to herself when the man appeared, a tall, dark, frowning creature with black angry eyes and a hurried air. Then his eyes sought the box which stood at her feet as she rose. Then Kerry lifted her wonderful purply-blue eyes under her shabby little hat, and unconsciously put her soul into them. The man eyed her through with his little coal-black eyes that were like knives they seemed so sharp. When he saw that she was telling the truth his face took on a cunning look. “Let me see it,” he said pointing to the box, his voice in no way softened, just sharp and hard as if he did not believe her. Kerry took the coat out of its wrappings and handed it to him. Its soft folds fell luxuriously over his hands. A glint of avarice came into his eyes. It was one of his best coats. Carefully he examined it in every little inch, inside and out. He saw it was not hurt. He could see it had not been worn. But his face was still hard.